The AMS Bev 30 vends a variety of different drinks from a 12oz can to a 24 oz bottle. Just shop at your local cash and carry and sell Starbucks glass bottles, juices, energy drinks, muscle milk and more. Medium to large locations. 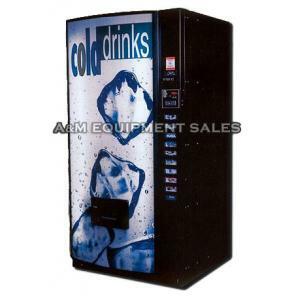 From a 12oz can to a 24 oz bottle, the AMS Bev 30 drink machine vends a variety of different drinks. Since AMS Bev 30 gives you such a huge capacity to vend a variety of different cans and bottles of cold coffee, juices, energy drinks, health drink and a lot more from your local coffee houses and health shops and proudly display them in your vending machine. With the capacity of holding 180 items at a time, the AMS Bev 30 is the beast of all the vending machines. Glass front drink machines sell at least 20% more than conventional drink machines. Your customer will want to see the variety that conventional machines don’t have. Amid the dimensions running about Height 72″, Width 35″, Depth 35″ , AMS Bev 30 is a masterpiece to look at. It is a must buy for people who believe in making more money. 30 total selections- All multi-priced. Dimensions Height 72″, Width 35″, Depth 35″. New 5 tube high capacity coin changer with dollar coin payout. Optional credit card reader can be installed $299.00. Vends 6oz to 24oz bottles and cans. Lifetime free phone tech support: 1-800-713-6217. AMS machines come with Sensit Guaranteed Delivery System. Spiral driven no shims can vend boxed drinks, milk, and yogurt. Parts Warranty 3 years with the exception of glass, light bulbs and paint finish. Shipping not included. Dimensions: Height: 72” Width: 35” Dept: 35”. Telephone technical support available Monday – Friday 8:00am – 5:00pm EST as long as you own the machine. A&M is the authorized distributor for AMS.